Nature can be extremely devious in the way it hides its secrets. Sometimes the most remarkable and profound insights are staring us right in the face every day in the most mundane phenomena. Image from Microscopy-uk.org.uk, by Michael Reese Much. Borrowing his lovely images until I can produce my own! 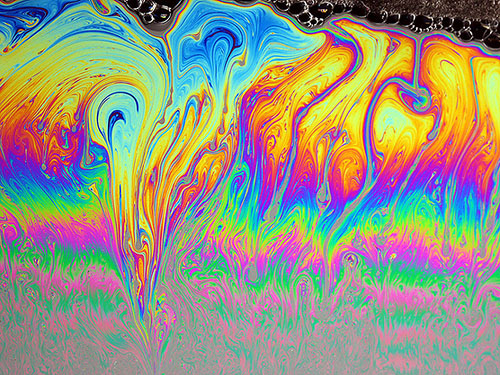 These colors are produced by optical interference, as we will discuss below; the “thin film optics” that creates bright colors in soap films also results in the bright colors of oil slicks. 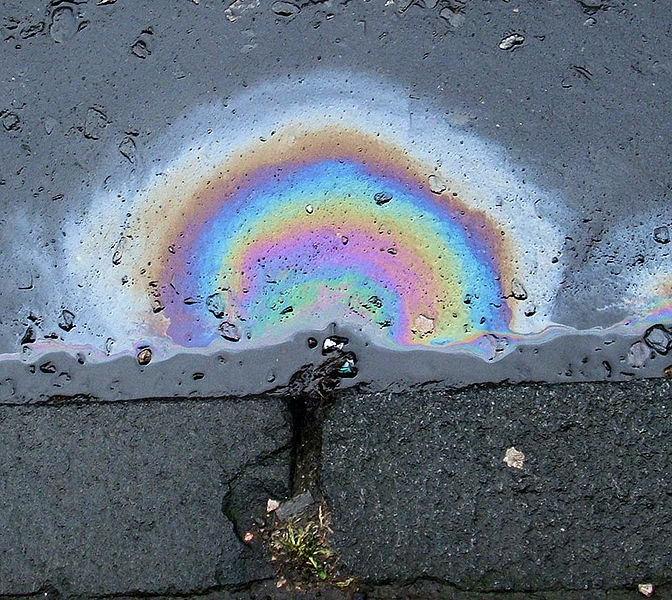 A rainbow of color produced by white light reflecting off of a thin layer of diesel fuel on water, via Wikipedia. Most of us would look at a soap film image and marvel at the beautiful rainbow colors; others would investigate the optics underlying them. 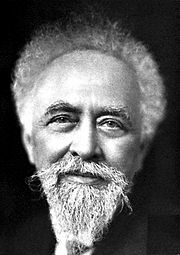 But it took an exceptional physicist, Jean Baptiste Perrin (1870-1942), to realize that these colors concealed something more: direct evidence that matter consists of discrete atoms and molecules! Today we take for granted that all material objects in the universe are comprised of discrete “bits” of matter, which we call atoms; however, even up until the early 20th century there were still proponents of the continuum hypothesis, in which all matter is assumed to be infinitely divisible. If two elements form more than one compound between them, then the ratios of the masses of the second element which combine with a fixed mass of the first element will be ratios of small whole numbers. indicating that oxygen can only join with carbon in discrete amounts. This strongly suggested to Dalton that matter such as oxygen exists in discrete quantities: the “atoms” of his theory. However, other researchers of the time argued that this law could be explained by the continuum hypothesis as well, with a little theoretical gymnastics. Arguments between the atomists and the continuum proponents continued through the 19th century. The fundamental difficulty for the atomic theory? Nobody could actually see atoms or molecules, or find any direct experimental evidence for their existence; without even an estimate of their size, the idea of atoms was purely academic. The continuum hypothesis was finally put to rest when, in 1905, Albert Einstein proposed an explanation for the phenomenon of Brownian motion, which had mystified scientists for nearly one hundred years. In 1827, the biologist Robert Brown noticed that minute particles ejected by pollen grains suspended in water were moving around in an irregular, jittery motion. An example of this motion is shown in the video below. Einstein explained this motion as due to the rapid and near continuous bombardment of the visible particles by the invisible molecules of the water surrounding them. Einstein’s theory explained Brownian motion both physically and mathematically, and furthermore the theory gave for the first time a method to calculate the density and size of the molecules. Einstein’s theory still needed to be confirmed experimentally, however, and Jean Perrin was perfectly suited in both skills and interests for the task! In the early 1890s he had been deeply involved in the investigations of mysterious cathode rays (now known to be streams of electrons) and the even more mysterious Röntgen rays (now called X-rays). In 1897 he earned his doctorate in science and became a lecturer of physical chemistry at the Sorbonne in Paris. With his new position, he became fascinated with the “molecular hypothesis” (more or less another term for the atomic theory) and began extensive investigations into the subject. When Einstein’s theory of Brownian motion was put forth, Perrin devoted his efforts to confirming the theory and determining an estimate of molecular size; his results were published in 1910 and contributed to Perrin’s Nobel Prize in Physics for 1926. The objective reality of molecules and atoms which was doubted twenty years ago, can today be accepted as a principle the consequences of which can always be proved. Nevertheless, however sure this new principle may be, it would still be a great step forward in our knowledge of matter, and for all that a certitude of a different order, if we could perceive directly these molecules the existence of which has been demonstrated. To make this direct measurement, Perrin turned to a phenomenon that had fascinated him since childhood: the colors of soap bubbles! The spectacular colors of soap films come from a wave interference effect, as illustrated below. An example of destructive interference in thin films. 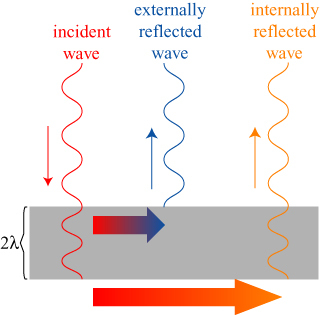 The two reflected waves (shown horizontally offset for clarity) partially cancel out. Let’s first imagine that a light wave comes in on a thin film which is two wavelengths λ thick — this means that two complete “ups and downs” of the wave exactly fit inside the film. Part of the wave will be reflected from the exterior surface of the film (shown in the middle) and part of the wave will be reflected from the interior of the film (shown on the right). Glossing over some subtlety in the nature of reflection from the inside and the outside, we can see that the two reflected waves are out of phase — where one is waving left, the other is waving right, and vice-versa. The two waves destructively interfere, and the net result is that very little light reflects at that particular wavelength. In a slightly different situation, let us imagine that a light wave comes in on a thin film which is two and one quarter wavelengths thick! 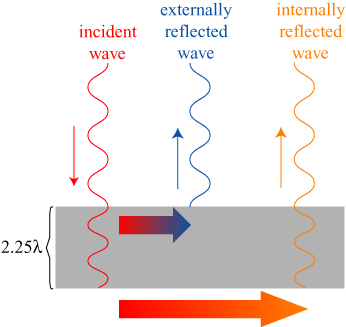 An example of constructive interference in thin films. The two reflected waves are in phase and constructively interfere. Now the two reflected waves are in phase — they both wave left and right at the same time. These waves constructively interfere, and the reflection of the wave is increased. This enhancement is the source of the bright colors of a thin film! Because a thin film will only reflect light of certain wavelengths, and the reflected color depends on the film thickness, the reflected color is a direct measure of the film thickness. Looking again at the soap bubble picture from the beginning of the post, we can now interpret what is going on. You know the properties of thin laminae: each ray reflected from such a lamina is formed by the superposition of a ray reflected from the front side of the lamina on a ray reflected from the rear side. For each elementary colour these rays add together or subtract from one another according to a classical formula, depending on whether they are in phase or out of phase; in particular, there is extinction when the thickness of the lamina is an even multiple of one quarter of the wavelength, and there is maximum reflection when it is an odd multiple. If, therefore, white light strikes a lamina which has a thickness increasing continuously from zero, the reflected light is at first non-existent (black lamina), then weak (grey lamina), then lively and still almost white, becoming successively straw yellow, orange yellow, red, violet, blue (tints of the first order), then again (but with different tints) yellow, red, violet, blue, green (second order); and so on, the reflected colour becoming continuously more complex and more off-white up to the “white of a higher order” (the spectrum is furrowed with black grooves the number of which increases with the thickness of the lamina). All these tints will be present at the same time on a lamina which has not a uniform thickness and which will be black or grey in its thinnest region, straw yellow in a thicker region, red in an even thicker region, and so forth. At the top of the film where it appears black, it is in fact almost perfectly transparent: the film is so thin that it reflects almost no light at all, and we see the black screen behind it. It is to be noted, in the figure above, that near the top of the film, there are regions of bright and nearly constant color, bounded by lines where the colors change dramatically. Perrin realized that something interesting was happening at these transition lines. Having examined a large number of stratified laminae, it occurred to me, before I made any measurement, that the difference in thickness between two adjacent bands cannot fall below a certain value and that this elementary minimum difference, a kind of “step of a staircase”, is included a whole number of times in each band. Similarly, if we throw playing-cards on the table, the thickness at each point is that of a whole number of cards, without all possible thicknesses being necessarily present, since two or three cards may remain stuck together. 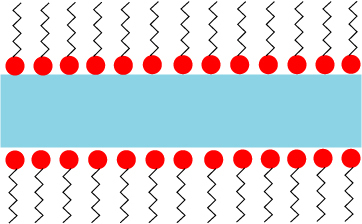 The stratified liquid strips would, therefore, be formed by the piling up of identical sheets, more or less overlapping each other, their liquid state imposing on the free contours the form of arcs of a circle (which are fixed at their extremities on globules or on the non-stratified periphery, according to conditions so far unknown). In short: where the soap bubble is at its thinnest, it can only be a finite number of molecules thick. At any point where it gets thicker or thinner, the thickness must change by a discrete number of molecular thicknesses. Perrin likens this to a random pile of playing cards, whose thickness on the table can only change by the thickness of one card; I crudely illustrate the idea for layers of soap molecules below. By measuring the reflectivity of the thin film for the different regions of uniform colors, Perrin was able to deduce how much the thickness of the film changed between regions. He collected a large number of these differences in thickness; assuming each must be a multiple of the molecular thickness, he was able to determine the size of the soap molecules! The measurements confirmed this impression. From 1913 onwards I found a value ranging between 4.2 and 5.5 mµ. 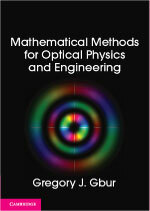 And since then, precise photometric determinations made under my direction in 1921 by P.V. Wells, who otherwise had to overcome serious experimental difficulties, have fully established what we can call a law of multiple thicknesses. We first of all applied simply the classical relationship between the thickness of the lamina and the intensity of the reflected light, using monochromatic lighting. On the first-order band 120 measurements were made, giving thicknesses grouped according to the law of chances around 4.4 mµ. It is certainly the best measurement made so far of the thickness of the “black spot ” for which Johonnott gave 6 mµ. The extreme thinness of this band, the faintness of the reflected light, and the difficulties due to parasitic lights make this determination particularly interesting. The set of the measurements for the first fifteen bands give similarly thicknesses which are, within several hundredths, of the successive multiples of 4.5 mµ. Perrin therefore found a value of 4.5 nanometers (4.5 billionths of a meter) for the size of soap molecules. This number may seem much too large to those who know a little atomic physics: atomic sizes are usually measured in angstroms (0.1 nanometers), and the soap molecule is over a factor of ten larger. Perrin’s result is not surprising, however, because soap molecules are fashioned as large chains of other molecules, as shown below. Two chemical representations of sodium stearate, a typical soap molecule. Via Wikipedia. Soap derives its effective cleaning properties due to the fact that one end of this chain is repelled by water (hydrophobic) and the other end is attracted to water (hydrophilic). The right side of the molecule shown above, the polar end, is attracted to water; a film of soap therefore consists of a collection of soap molecules standing at attention, side by side. Monolayer of soap molecules encasing a thin film of water. The red spheres represent the polar ends of the soap molecules. It is interesting to note that Perrin’s experiment is similar in philosophy to the Millikan oil drop experiment, performed a few years earlier in 1909. In the Millikan experiment, microscopic droplets of oil were imbued with a small amount of electric charge, with presumably only a small and countable number of electrons in each droplet. Though it was not possible to reliably imbue a droplet with a single electron charge, Millikan measured the charge for a large number of drops and demonstrated that the difference between droplets was always an integer multiple of a fundamental value: the charge of the electron. Similarly, Perrin demonstrated that the difference in soap film thicknesses was always an integer multiple of the size of the soap molecule. Perrin was aware of Millikan’s work, and it seems not unreasonable to assume that he was inspired by it, whether he realized it or not. It was not the first strong evidence of molecular existence; Einstein’s Brownian motion explanation was the deciding factor. With modern technology such as atomic force microscopy, we can produce images of objects, including molecules, with sub-nanometer resolution! Though Perrin’s work with soap films did not fundamentally alter our understanding of the natural world, it is an imaginative and beautiful result that demonstrates that profound insights can come from even the most mundane observations. Who knows what other scientific discoveries are hidden in plain sight, right before our eyes? * Quotes on the soap bubble experiments will be taken from Perrin’s Nobel lecture, as his original 1913 paper is brief and less detailed. The original paper is J. Perrin, “Observations sur les lames minces,” Archives des Sciences Physiques et Naturelles 35 (1913), 384-385. ** Perrin himself notes, however, that a similar technique was used to determine the molecular size of mica, a solid which can be divided into thin planar sheets. This entry was posted in History of science, Optics. Bookmark the permalink. Well, we can’t be seeing destructive interference — the light has destructively interfered, i.e. cancelled out in reflection! 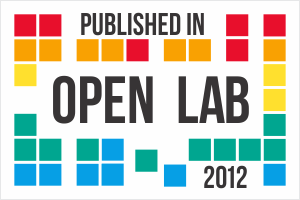 There is a complementary color effect, however: those colors that don’t reflect are transmitted, and vice versa. If white light is used to illuminate a thin film, the transmitted and reflected light are perfect complements of one another. Perrin wrote the extremely influential book Les Atomes which put together maybe a dozen methods of determining Avogadro’s Number. That was the book that more or less clinched atomic theory. I’m not sure if he used the soap bubble method in the book. I think he used a variety of manufactured colloids and measured their pressure half heights to estimate atomic sizes. I’m glad he’s getting some new press. Yes, he was quite the scientist! His Nobel lecture describes the variety of ways in which he (and others) measured Avogadro’s number. He doesn’t seem to be as well known as many other Nobel laureates, though his contributions were clearly of fundamental importance. I suspect that this is, in part, due to the fact that he did so many things that it is hard to describe in a simple manner his contributions. can any one please let me know which color corresponds to what thickness ?